If you are using body sensors (i.e. Kinect, Astra, Leap, etc. 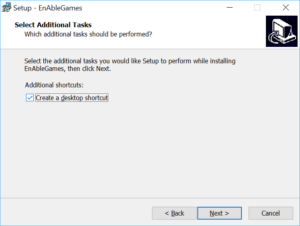 ), please connect your equipment and install all Device Drivers BEFORE running the enAbleGames App. The App needs drivers to be installed in order to track your body. The new color-tracking beta feature for hand-tracking does not require any drivers and uses your standard web camera. See Installing Device Drivers section below. 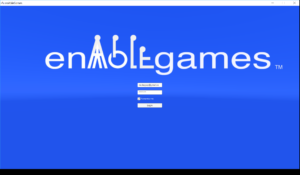 Go to the www.enablegames.comsite and click on the Gain Access tab. 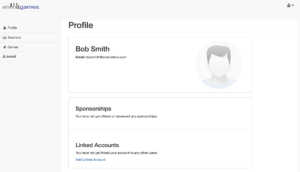 Home account (for an individual Player). Click on the Sign up! 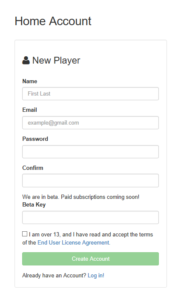 link under Player to create an account. 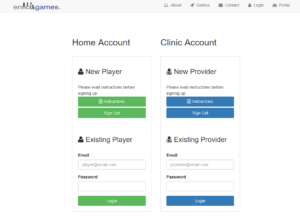 NOTE: Clinic accounts come with 4 Home/Player accounts included. Extra players can be added individually by clicking on Sign up! under the Care Provider’s profile page. 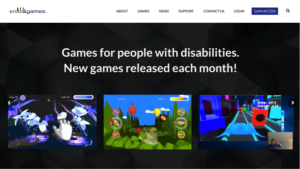 You will then be taken to the enAbleGames Player or Care Provider Portal. Place the Kinect or Astra sensor near the screen. The screen may be your laptop screen or a flat screen TV if one is available at your clinic or home site. The Kinect should be placed below or above the TV, or near your laptop. Plug in your computer. The sensors work best with the computer on full power. Plug in the Kinect Adaptor’s USB cable to the BLUE USB port (USB-3 port) of the Computer. You must have a USB-3 port to use a Kinect V2 sensor. Plug in the Kinect Adaptor to the power strip. Make sure the white light on the Kinect adaptor power block is on. Plug the Astra into your USB port (must be a USB-2 or USB-3 port). Plug in the Kinect Adaptor’s USB cable to the BLUE USB port (USB-3 port) of the Computer. You must have a USB-3 port to use a Kinect sensor. Plug in the Leap sensor into a USB-2 port. If you are using a separate flat screen (not the laptop screen), plug in the HDMI cable to the Computer HDMI port and plug in the other end to the flat screen HDMI port. Now you are ready to power on the game computer! Every motion sensor you want to use needs a device driver. Download and install the appropriate sensor drivers. 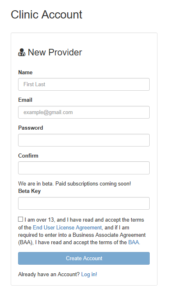 See www.enablegames.com/support for latest driver information. Do NOT click on the green DOWNLOAD FOR WINDOWS button. Instead, click on the link for V2 for Windows link. Installer: Downloads and installs all games. Patcher: Lets you know whenupdates to games are available, and installs updates if desired. Launcher: Displays available games and launches (runs) selected game. Body Tracker: Connects to body tracking devices, displays body motions using an avatar, and passes body data to games. Login Manager: Login once to the app, and you won’t have to log in to the games individually. The App must be running for the games to work, since the app handles logging in and passing the body motion data to the games. This includes VR games running on a phone. From the customer portal, click on the Install tab. 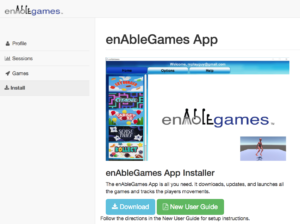 You will see our enAbleGames installer page. 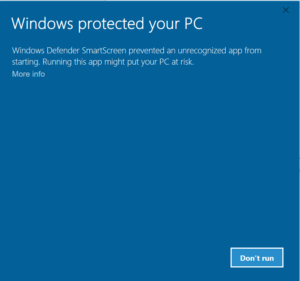 This is because It is not a signed Windows app, but that is ok. Click on the More Info text and a Run anyway button will appear. Click Run anyway and follow the setup instructions as described below. Make sure Create a desktop shortcut is checked. 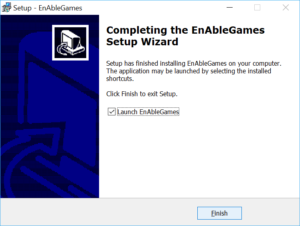 Check the Launch EnAbleGames option before hitting the Finish button. 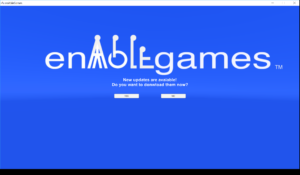 The enAbleGames launcher will be run. You will log in using the same account and password you just created. Once you log in, it will ask you if you want to install the available updates. Answer YES. Once updates are complete, you will see the enAbleGames launcher screen, where you can launch any of the games or check for updates (under Options). The yellow robot figure should move as you move. If it does not, please make sure your sensor camera is connected, and the device drivers have been installed as detailed in the Install Device Drivers section of this manual. If you do not have any motion sensor devices, you can still use enAbleGames using our new beta feature, color tracking, to track your hands. The Devices tab at the top bar toggles this feature on and off, and colors are selected using the Left and Right mouse buttons for the Left and Right hands. See the Color Tracking section on the eAg manual for more detailed instructions. 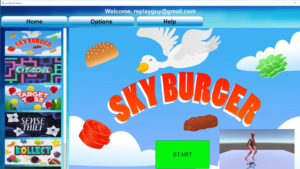 To run a game, click on the game image on the left scrollbar. Then click on the START button on the bottom of the screen. 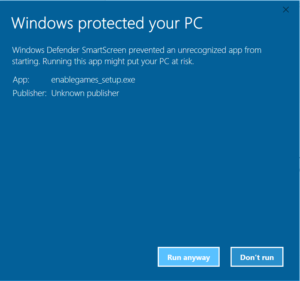 A window will pop up with the game’s screen options. Click Play. Instructions for the games can be found on our Manuals page. Please check the Support page FAQ if you have any problems or questions.